The Honda Navi Customania grand finale concluded amongst huge fanfare in New Delhi on Sunday, January 29, 2017. Dhananjay Parihar from Indore won the grand prize of Rs 2 lakh, while Ashiq Joseph Thomas from Kottayam grabbed the runner-up position, winning a prize of Rs 1 lakh. 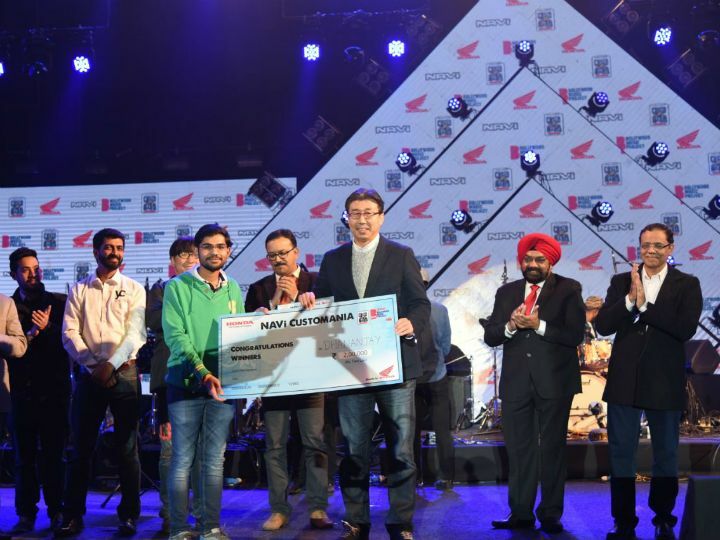 The winners were felicitated by Minoru Kato, President and CEO, Honda Motorcycle and Scooter India. The winners’ custom Navis will exclusively be showcased at the Honda Pavilion in the 2018 Auto Expo. The competition was started last year in October and saw over 10,000 participants throwing their hats in the ring in just a month's time. However, the highlight of the contest was seen in Stage 3 - City Finales -, conducted in 12 major cities, namely Pune, Indore, Goa, Nagpur, Hyderabad, Chennai, Kolkata, Bangalore, Lucknow, Mumbai, Ahmedabad and New Delhi. Each city saw two finalists battling it out for the grand prize by showcasing their custom Navis. Honda had also organised a separate web and mobile app edition of the contest, which saw Jyugaandh Veer Singh and Lalith Ankala emerging as the winners of the web and mobile app-based editions respectively. Marketed as neither a scooter, nor a bike, the Honda Navi is targeted towards the urban youth, looking for a fun and easy ride. Powering it is a 109cc engine, which churns out 7.94PS of power and 8.96Nm of torque. Honda has set a price of Rs 41,849 (ex-showroom Delhi) for the Navi.